STRATFORD, Ont. 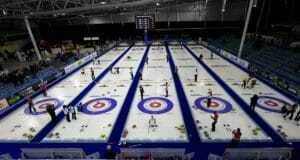 – The Canadian Junior Menʼs and Womenʼs Curling Championships, presented by Egg Farmers of Ontario, get underway Saturday at the Stratford Rotary Complex, a facility that features two ice surfaces — RBC Arena and Molson Arena — meaning every game at the Juniors will be played on arena ice for the first time in history. The ice is in place at the Stratford Rotary Complex for the 2016 Canadian Juniors, presented by Egg Farmers of Ontario. With 14 teams of each gender (representing the 10 provinces plus Northern Ontario, Northwest Territories, Nunavut and Yukon), the fields are divided into two seven-team pools, with seeding based on win-loss records from last year’s Canadian Juniors at Corner Brook, N.L. Teams play a round robin within their pool, leading to a championship pool beginning on Wednesday, followed by the weekend playoffs. Teams that donʼt qualify for the championship pool will play in a seeding pool to determine rankings for the 2017 Canadian Juniors at Victoria. 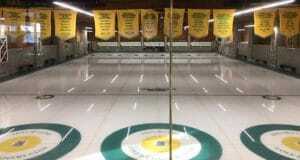 The non-playoff teams will then participate in a mixed doubles competition on the final weekend. This year’s Juniors will also see the debut of a new eligibility age that now aligns with World Curling Federation rules for the World Juniors. Previously, Canadian junior participants had to be 20 and under as of Dec. 31 of the year prior to the championship. Now they only need to be 20 and under as of June 30 of the previous year. All 28 teams will practise on Friday, beginning at 9 a.m. For the complete practice schedule, click here. You can access the event media guide by clicking here and downloading the zipped folder. The Canadian Junior Menʼs Championship has been contested annually since its inception in 1950 in Quebec City. The first Canadian Junior Womenʼs Championship was played in 1971 at Vancouver. Alberta has won a leading 16 Canadian junior men’s titles while Saskatchewan leads with 11 women’s titles. The men’s and women’s championships were contested in different cities until being combined in 1987 at Prince Albert, Sask. The last time the Juniors were held in Ontario was in 2012 at Napanee. 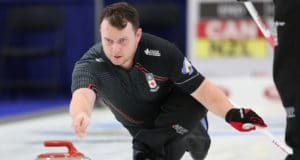 Teams representing the Ontario Curling Association have won the Canadian Junior Menʼs on nine occasions — the latest being Jake Walkerʼs team from Kitchener in 2010 at Sorel-Tracy, Que. Ontario teams have won three Canadian Junior Womenʼs titles, with Ottawaʼs Rachel Homan completing the Ontario sweep in 2010. Representing host Ontario this year are teams skipped by Courtney Auld of Thornhill and Doug Kee of Navan. The men’s lineup also includes 2013 Canadian junior champion and world junior bronze-medallist Matt Dunstone of Winnipeg, who will try to claim a fourth consecutive title for Manitoba, following skip Braden Calvert’s back-to-back victories in 2014 and 2015. Also competing is last year’s Canadian junior silver medallist, Jacob Hersikorn of Saskatoon. On the women’s side, Northern Ontario’s Megan Smith from Sudbury won gold at the 2015 Canada Winter Games at Prince George, B.C., while Nova Scotia’s Mary Fay of Chester was a bronze-medallist at the 2014 Canadian Juniors at Liverpool, N.S. and a silver-medallist at the 2015 Canada Winter Games. British Columbia skip Sarah Daniels of New Westminster played second for Kalia Van Osch on the silver medallist team at the 2014 Juniors, losing the final to Alberta’s Kelsey Rocque. This year, the Alberta teams will be skipped by a brother and sister — Karsten Sturmay and Selena Sturmay, a rarity in Juniors history. The last brother and sister to skip at the Juniors in the same year were Northern Ontario’s Joe Scharf and Krista Scharf (McCarville) in 2000. Prior to that, it was Northwest Territories’ Jamie Koe and Kerry Koe (Galusha) in 1998. 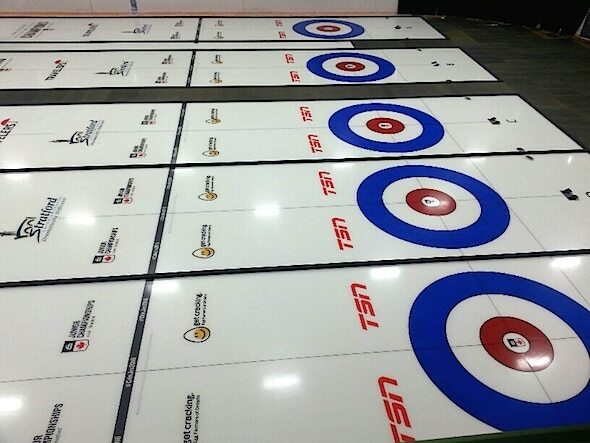 The menʼs and womenʼs champions at Stratford will then represent Canada in the 2016 World Junior Curling Championships at Erzurum, Turkey, March 5-13. Canada has won a leading 18 world junior menʼs titles since 1975 and 10 womenʼs crowns since 1988. Last year at Tallinn, Estonia, both the Canadian men (skipped by Braden Calvert of Winnipeg) and the Canadian women (skipped by Kelsey Rocque of Edmonton) swept world junior titles. Both Karsten Sturmay and Nova Scotia women’s lead Janique LeBlanc are former winners of Curling Canada’s For The Love of Curling youth scholarships. Also notable is that Fay and her Nova Scotia second Karlee Burgess, along with B.C. men’s skip Tyler Tardi will comprise three-quarters of Canada’s team for the Youth Winter Olympics, Feb. 12-21 in Lillehammer, Norway. As part of the tournament celebrations, 2014 Olympic gold-medallist, and two-time Canadian junior champ, Kaitlyn Lawes will be the keynote speaker at the Closing Banquet on Friday, Jan. 29. Tickets are now available for purchase online by clicking here, or at the Stratford Rotary Complex as of Friday. A variety of ticket options are being sold, including an All-Event Access pass, Closing Banquet, Opening Ceremonies Admission, Championship Weekend Passes, Single Draw and Single Day Passes. TSN/RDS2, the official broadcaster of Curling Canada’s Season of Champions, will provide live and exclusive coverage of the womenʼs and menʼs semifinals on Saturday, Jan. 30, and finals on Sunday, Jan. 31.